Wowee. It’s fall you guys. And if there’s one thing I love about this time of year it’s that my body begins craving slightly heartier, soul-warming foods. You know like muffins! Pumpkin muffins even. Oops! I didn’t even realize these ones have chocolate chips. Oh well. Guess I’ll have to eat them all. These muffins require just 1 bowl and about 30 minutes. The ingredients list is also really simple, with the basics being flour, brown sugar, pumpkin, cinnamon, almond milk, and chocolate chips. If you’re not a big chocolate fan, you can just leave you could easily sub in oats or even apples! These muffins are UBER moist; as in uber. Some might even be like, “Wow, that’s a moist muffin.” But is that such a bad thing? I will say, however, if you prefer a more crumbly muffin, simply add in a touch more flour and/or a handful of oats to absorb more of the moisture from the almond milk and pumpkin. Tender, sweet, moist, cinnamon-y (VEGAN! ), and studded with melty chocolate chips. That’s what you can expect from these little guys. I’ve been enjoying mine at breakfast with coffee and in the afternoon with tea. They really are the perfect snack or item to bring to a gathering. Pumpkin season has officially arrived and I couldn’t be more stoked. Hooo-ray! 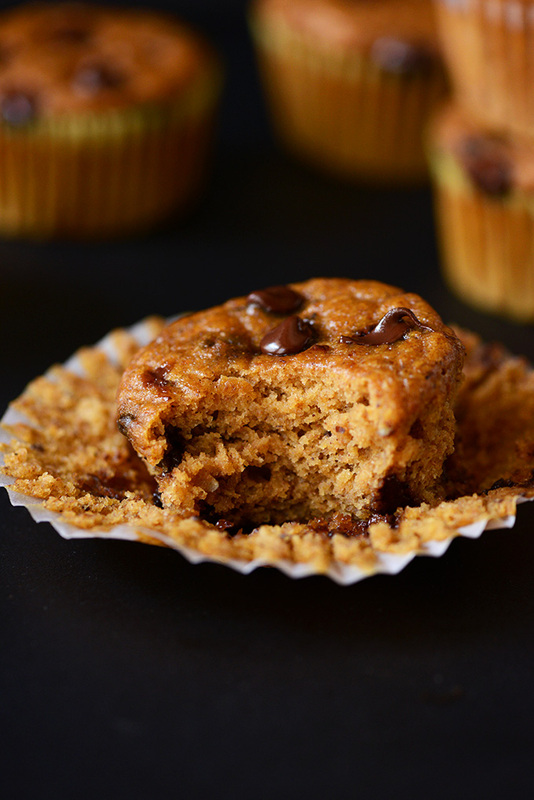 Vegan pumpkin muffins studded with chocolate chips. Super moist, simple, and the perfect fall breakfast or snack. Preheat oven to 375 degrees F (190 C) and line muffin tin with paper liners. Prepare flax egg by mixing flax meal and water in a large bowl - let rest for 5 minutes. Add pumpkin puree, almond milk, brown sugar, oil, and vanilla extract and stir. Then add salt, baking soda and powder, and cinnamon and whisk. Carefully place flours into a sifter and sift over wet ingredients and stir. Add chocolate chips and stir again lightly until just incorporated. If the batter appears too thick, add a splash of almond milk or orange juice. Otherwise, you're ready to bake! Spoon into paper-lined muffin tins (should be 11-12 as original recipe is written) until each liner is filled almost completely full (about 7/8ths). Sprinkle a few more chocolate chips on top for presentation (optional). Bake for 22-28 minutes or until fluffy, golden brown and a toothpick inserted into the center comes out clean. Let rest in the pan for 5 minutes, then transfer to a wire rack to cool completely. Store in an air-tight container or bag. Freeze for long-term storage. *These muffins are very moist. 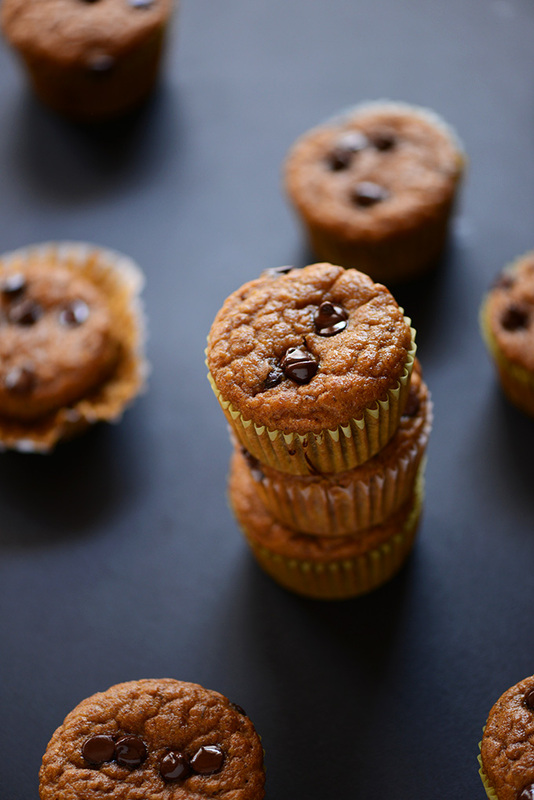 If you prefer a more crumbly muffin, simply add a touch more flour and/or a handful of oats to absorb more of the moisture from the almond milk and pumpkin puree. *Right out of the oven, these can stick to the paper liner. I recommend letting them cool completely, covering them in a sealed container for a couple of hours and then trying again. They should come right loose! Hi there can this recipe also be used as a loaf bread recipe? These muffins turned out great! I used Vegan Egg instead of flax and pumpkin pie spice. Any tips for less sticking to the papers? Thank you, I love your site/insta and books I can hold in my hands. Hi Charlotte! I’d recommend spraying them with nonstick cooking spray or brush with a little melted vegan butter. Are my eyes deceiving me but where in the recipe do you use the lemon juice? I’d add it along with the pumpkin puree, almond milk, and brown sugar! I’ll agree with what some others have said, they’re good but not great. I like them but I think I’ll look for another pumpkin chocolate chip muffin recipe to try next week. This is good, not “healthy” as some said to me. I found it to be the perfect amount of sweetness for me. But I agree the parts of muffin without chocolate don’t taste like much—shame, I really wanted a pumpkin-y muffin. I went a little extra on chocolate and used chocolate chunks rather than chips. I greased my pan with a bit of coconut oil, used no wrapper, and they only stuck the slightest bit. I usually use an avocado oil sprayer so I’ll try that if I do make these again. flax egg => chia egg, pumpkin puree => apple sauce, lemon juice => apple cider vinegar, almond milk => oat milk, replaced whole wheat flour with unbleached all purpose flour, followed the recommendations and added 1/2 cup of fine rolled oats to get rid of excess moisture (great tip, will do that for pumpkin/zucchini bread in future, too) and left out the cinnamon (it being summer and all). Sooooo good and didn’t last long in an office full of omnivores. I love that your recipes are so easy going & that you can just work with what you have/works for you :). Thank you for sharing your recipe changes, Yulca! We’re so glad you enjoyed them! I just made these pumpkin muffins. Thanks for the recipe. Yay! We’re glad you enjoyed them, Pauleen! -I use 1-1/2 cups of whole wheat pastry flour instead of the all purpose / whole wheat mix. The muffins come out a bit lighter and higher. -I grease the muffin tins with coconut oil and skip the paper liners. The muffins pop right out after cooling for ~5 minutes, and have a lovely golden crust all around. -I sprinkle just a bit of demerara sugar on top of each muffin before baking. How long is the bake time if made in to a loaf–if it’s all right to turn into a loaf? Hi Queenie! I think it would work fine! Just lower the heat by 10 degrees and cook for 10-15 minutes longer or until a toothpick comes out clean! hey there! do you think i could sub the all purpose flour with almond flour? Hi! Someone has tried making this recipe, and used half gluten free flour (any all purpose brand) and half almond flour; it turned out really well. hello! could you substitute 3 tbsp aquafaba (like used in the almond butter chocolate chip cookies recipe) for the flax egg? So excited to make these! Hi! We haven’t tried it, but it should work! I had roasted butternut squash and didn’t feel like making soup, so I tried this recipe with the squash instead of pumpkin. I doubled the recipe and used 2 cups whole wheat and 1 cup all purpose flour, and I ended up adding fewer chocolate chips because I just used what I had left in the bag. I put walnuts on top of some of them for me, and left the others without for the kids. They’re really very good, and they freeze well for reheating in the morning. I see some people say there are bland or not sweet enough, but I disagree. Muffins aren’t supposed to be too sweet! Oops! The instructions do not include adding the flax egg in after you’ve set it aside. Luckily I caught it one minute after I put the muffins in the oven – phew! Actually, you add all the ingredients TO the flax egg, which is mixed in a large mixing bowl. Hope that wasn’t confusing! Making my second batch of these this week! So good!! Perfect for a fall snack or breakfast. I made these last night, and wow they are amazing!!! I replaced the enriched flour with Bob Mills 1 to 1 Gluten Free flour and instead of unsweetened almond milk I used vanilla almond milk. I’m so happy with the results, so fluffy and fresh. I plan on trying a few more baked sweets from your recipes. Think next on the list is the banana bread cinnamon rolls! I just made these and they turned it great! Just wanted to share something I learned from another muffin recipe. I baked at 425 for 5 min then turned the oven down to 375 for the remaining time and it made them nice and tall!! I made these tonight and although I found them to be tasty, I agree with many of the other reviewers who stated they’re a bit bland. I tend to have an fairly bland palate but even I thought these could have used a little more spice. I disagree that they aren’t sweet enough though, since they’re intended to me a muffin, not a cupcake. My biggest disappointment, however, was how difficult they were to remove from the muffin liners. I waited until they were completely cool as the recipe states but removing the liners still pulled off the entire bottom half of the muffin. Did I do something wrong? I made these last month, making my own puree with a pumpkin from our garden, and they turned out great! It was also my first time experimenting with a flax egg, so thanks for including the link to those instructions too. I used spelt flour only, and I think it worked very well with this. :) Thanks! Same results as some of the other reviewers. I followed the recipe save for using all whole wheat flour, and these turned out merely alright. They aren’t bad, but they are very “healthy” tasting like a bran muffin. I probably won’t make this recipe again, but if I did I would make sure to have white flour and add more cinnamon. 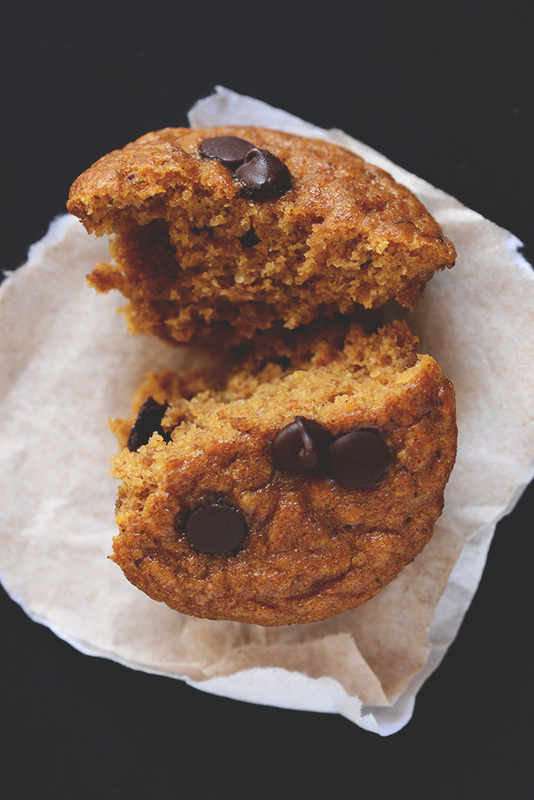 They didn’t really taste like pumpkin either, they’re more like healthy chocolate chip bran muffins. Also, they were alsmot over cooked at 22 minutes, even though I checked the remperature of my oven with a thermometer. I would recommend checking them at 20 minutes for doneness! Made tonight and was a bit disappointed. Not enough flavor and a tad too bland or not sweet enough. Just ok.
oops, menat to leave that comment on the berry muffins, i am actually making the pumpkin chocolate too! I made them last week and it was a huge hit. I just made these! OMG! The fluffiest, moistest perfectly sweet muffins. I submitted the berries for cubed banana. Has anyone subbed the oil with coconut oil? How did it turn out? Great recipe I couldn’t wait to try since finding your web site a few weeks ago! I am glad I looked at some of the comments below the recipe as it helped because I had no all purpose flour and used whole wheat pastry flour in its place. I did add some additional spice too but will try someone’s suggestion next time to add a few spices including nutmeg. One problem I did run into however, is I made some regular sized muffins & made a tray of mini muffins too. The mini muffins will NOT come out of the paper sadly. They will mostly be a waste because the paper does not peel away nor taste so good. Not sure what happened as they were in the frig over night. Then I tried to take one out of the paper. No go! I cook with propane so not sure if the higher heat point caused the issue or if I cooked them too long perhaps? What I did taste, did taste yummy! Thanks for sharing the recipe. I will try it again. I may just spray my mini muffin tin and not use the paper next time or skip the mini muffins and make full size. So… these look amazing but I’m not exactly vegan. is a flax egg the equivalent of 1 regular egg. Yes! Check out our Recipe FAQ for more information on substitutions! 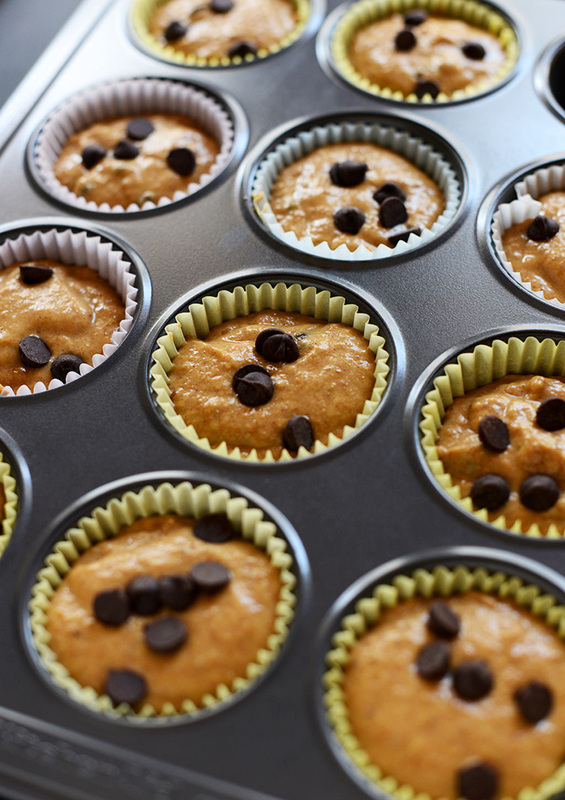 I loooove this recipe… even when I changed the flour and the purée, the cupcakes came out perfect!!!! 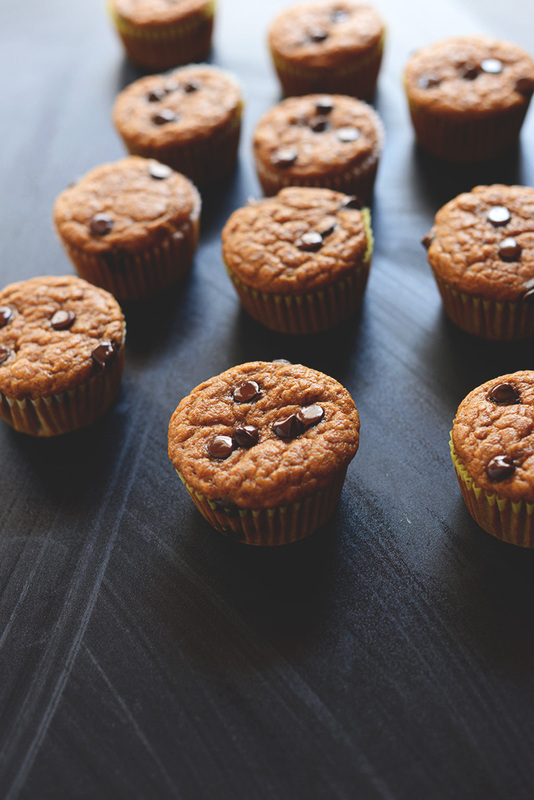 And it was My first time making muffins so…. Thanks so much for the recipe, amazing!!! Can I make these with coconut flour? I need it to be gluten free! Hi, my Son is allergic to almonds…what are your thoughts about substituting regular milk in this recipe? Thanks! Sorry about that Aurora! I found these to be moist and light, personally. If you’re interested, this is an updated version, and you could simply add chocolate chips and skip the crumb topping! I just wanted to share how much my family and I enjoyed this recipe! As a new vegan, I loved being able to indulge in a delicious dessert. Thank you and LOVED the moisture. I actually shared a few pictures of how mine turned out on my blog if any of y’all care to see! Thanks again so much. You’ve opened my world in the kitchen as a new vegan. Ah, thanks for sharing! So glad you liked them! I just made these for a bunch of toddlers. I can easily say kid approved! These kids were going back for seconds and thirds. Out of Twelve of these muffins, I only have three remaining. Hands down a wonderful recipe and great muffins. These muffins turned out really tasty! I used only whole wheat flour and no lemon juice since that’s what I had. The muffins rose beautifully which isn’t always so simple at high altitude. There was only enough batter to make eight muffins. Thanks for sharing this recipe. Outstanding. My 1st grader, brings them for school. Super moist, definitely a keeper. I just greased the pan, nothing stuck. I’m just wondering how you would substitute with buckwheat flour, what would you add to keep the batter moist? Once again, great recipe. I am constantly impressed with each of your new posts and I am yet to find anything on your website that I dislike! Thanks Nicola! I haven’t used buckwheat flour much, but would add it into a gluten free flour blend if I were you, as opposed to subbing it 100% for the all purpose..I’ve found it can make the final product a little too dense and nutty for my liking. Let me know if you do any experimenting! would you consider these healthy? These are the best pumpkin muffins I’ve ever made. I’m pretty new to dairy and egg free baking, most of what I’ve tried hasn’t turned out great but these are AMAZING. Thank you! My kids loved them too, especially my 9 year old who loves pumpkin and my 1 year old who cried when his was gone. He’s the one with food allergies, and it made me so happy to be able to make him a treat that is delicious enough for everyone and not some weird “special” treat that isn’t actually all that good. I used coconut milk and coconut oil but otherwise followed the recipe exactly. I’ll be making these again, probably tomorrow! I would love to know if these can be made into mini muffins and if so what is the cooking time and temp? I would love to make these for snack time for my daughters pre-school as we are part of a co-op homeschool preschool and my daughter is allergic to dairy. I really am excited to try this especially since we host the week of thanksgiving! What a great snack this would make! I am really looking forward to making this for a bunch of hungry two-year-olds! I am currently following AIP diet and am wondering if I skip the flax egg, will this still turn out? I am going to try subbing cassava flour so they will be gluten free too. Just curious if the “egg” is even necessary? Thanks! Wonderful! Thanks for sharing, Paula! So I had some leftover butternut squash and was in search of a muffin recipe to use it in and I subsituted it here with your recipe. I had twice as much so I doubled the recipe. We are not vegan so I used real egg, milk mixed with a little whipping cream cuz it was in the fridge. I blended the flours and did add the small handful oats. I generally just doubled the recipe. I used 3/4 coconut sugar and 1/4 cup evap cane sugar. Added a sprinkle of grnd ginger, allspice, clove and cardamom to round out the cinnamon. They look amazing and I am looking forward to tasting them. I usually forget to come back to comment so I did today while the computer was still open. Thanks for the recipe! So great! Glad you enjoyed them, heather! Thanks for sharing your switches! Update..the muffins were a huge hit in this house and the kids have asked me to make more for the lunch kits! Yay! Thanks for sharing, Heather! I have plain canned pumpkin and organic pumpkin pie mix in the cubbard. Which do I use or do I need to go to the store? canned pumpkin puree! Not pie mix. Thank you! I used the canned pumpkin and they turned out great. If the canned pumpkin doesn’t say pumpkin pie mix, is it the same as pumpkin puree or will it at least work in place of pumpkin puree? Also have you tried making these as mini muffins? If so what cooking time and temperature should I cook them at? I would love to make these small for younger kids. I’m super excited to make these this Thanksgiving, but I was wondering if you think I would be able to substitute the brown sugar with date sugar, or another sugar substitute?? Thanks so much! Really good recipe! The only thing I changed was that I used 1c white whole wheat flour and 1/2c AP flour. I think next time I’ll try it with all WWW flour. I baked for about 30 minutes and they were still a little too moist (I did the toothpick test and it came out clean) so I might add some oats or more flour next time. My husband and I are relatively new to the vegan world and this is our first baking attempt being vegan. These muffins were phenomenal! My 7 year old son said they were the best muffins he ever tasted? The manager of the bulk department at my local Whole Foods told me about your blog. Love your recipes. I have lots of food sensitivities so I am always in search of great wheat, gluten, oat, and dairy free recipes. Many of yours fit into that bubble. I haven’t had a muffin in months and love them in the fall and winter for snacks. 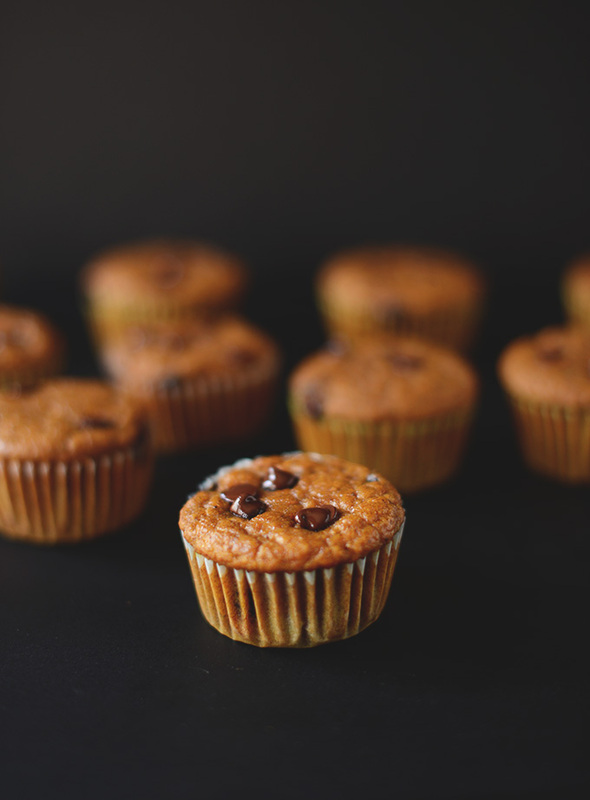 Have you had luck substituting whole wheat and regular flour for Arrowhead Mills gluten free all purpose baking mix in this muffin recipe as well as some of your others? Ah yay! Love Whole Foods. So glad you found us! I haven’t tried making this recipe GF, but I have a similar one coming up in which I will! Stay tuned, Beth! These look absolutely amazing! I was wondering how spelt flour would work in the place of the whole wheat? I have some that I’ve been wanting to use up, and it seemed like it might provide a nice texture. That might work! Let me know if you give it a try, Tanya. I made these and they were very moist, but i didn’t taste pumpkin. Did i do something wrong? Hmm, perhaps add more pumpkin pie spice next time? Made a double batch of this recipe earlier in the week and couldn’t figure out why they were so overly moist, then realized I doubled everything except the flour…(Only I would be that forgetful, haha). Made a double batch today with the correct proportions today, except I subbed vanilla soy milk and added nutmeg, and they turned out beautifully. Moist and not dense while still being rich in flavor. So excited to make these in the upcoming fall and winter season. Thank you! I could have sat there with a spoon and eaten the whole bowl of batter. So yummy! We used hemp seed oil (we were out of our usual baking oil) and it turned out so rich. Also, we didn’t have enough vegan chocolate chips so did a kind of trail mix thing adding walnuts and raisins to the mix. Just fantastic!!! Great idea! Thanks for sharing, Yanic! I just made these. The batter turned into gelatinous mess, it was hard to incorporate the chips in. What did I do wrong? Over mix it? The mix turned out very glutinous , like I was baking bread. It was difficult to incorporate the chips into it. What did I do wrong? Overmix the batter? Great! Thanks for sharing, Leigh! Hope the party goes well! I made these and would really recommend against using paper liners–no matter what they stick! I would just spray the pan and forgo the liners. Whoops! I see it now. Oh well…I’m sure they’ll be fine. You never mention when to add the flax egg?! Unfortunately I realized this AFTER I put them in the oven. My sister and I just stumbled upon your website and we’re obsessed!! We’re picking one of your recipes to try every week and this week it was these babies!! We did a little subbing, like 1 cup of sprouted wheat flour + 1/2 cup coconut flour, coconut oil, 2 tablespoons of organic maple syrup, and additional spices like nutmeg, ginger, allspice, and clove. They are AMAZING! And we folded in vegan choco chips into half the batter…literally amazeballs. Thank you so much for posting this one and please keep posting in the future! Your recipes are awesome and my sister and I had a blast baking these together. Ah, thanks Bryanna! So kind. I hope you and your sister enjoy making the recipes. Cheers!! How could you make this gf with a blend that already contains xanthum gum? Will this work well as a loaf? I want to make sure it will cook all the way through and not burn on the sides. I think it would work fine! Just lower the heat by 10 degrees and cook for 10-15 minutes longer or until a toothpick comes out clean! Made these tonight! So delicious! Thanks for the recipe. Holy molly these are soooooooo good! I have to say, this is the best vegan muffin recipe that I have made to date. Really moist and just the right amount of sweet. I am planning to make these muffins tomorrow but would like to incorporate oat bran into them as well. I know that requires me to mix oat bran with buttermilk, but I was wondering if you had an idea of how much of those ingredients I should use. Buttermilk (which is a substitution for almond milk) is already needed in the recipe so I am guessing I would add more but only use it to mix it with the oat bran and let it sit. If you could let me know if you have an answer or not I would really appreciate it! I love all your recipes. Thank you so much for your time!! I always come back to this recipe when I need something easy and unfailingly delicious. SO amazing! My muffins fluff up more than the ones in your picture, and they take 18-20 mins max. I don’t know if that’s my oven or the fact that I use Ener-G egg replacer instead of flax eggs. But people ALWAYS beg for the recipe. I made this last week and it came out so yummy. I sub the whole wheat flour for spelt flour and white flour for oats flour, because I didn’t have all ingredients at home. I love your recipes. Everything I made so far, came out incredible tasty. These look AWESOME! I’d love to try it as a bread though, how could I possibly adapt it? Thanks! Hello! thanks so much for kickin’ down great vegan recipes! I have these babies in the oven now! :) Question for you: Unless I’m missing it, which is very possible, I didn’t see where the flax egg gets incorporated into the batter. Am I missing it? :) Thanks again! The flax egg is mixed in a large bowl and then the ingredients are added to that same bowl. So it’s basically the first ingredient. Hope that helps! Can’t wait to try this recipe, although I might have to substitute mini cinnamon chip for the chocolate chips in one batch. 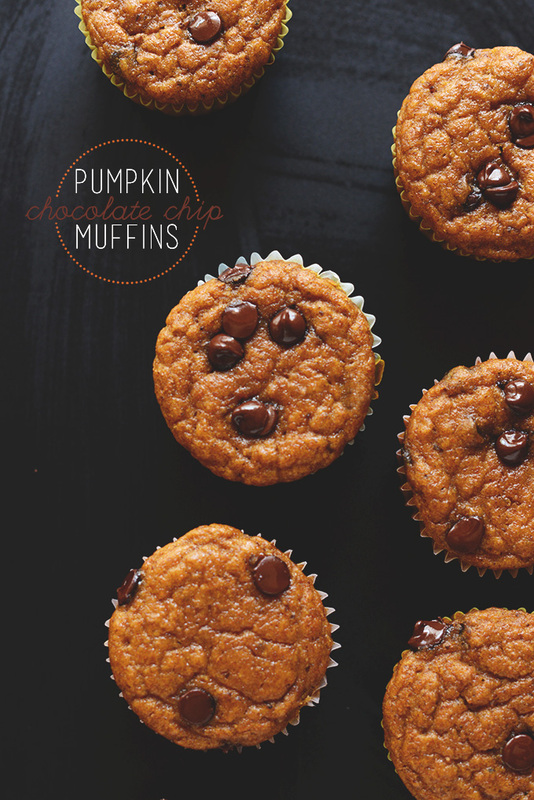 I love pumpkin and chocolate but pumpkin with cinnamon chips is even better! I made these this morning. I substituted soy milk for almond milk and since I didn’t have any lemon juice is used 1 Tsbp of cider vinegar instead. I also added a dash of ginger, nutmeg and all spice and they turned out delicious! My only problem is that the paper stuck to the muffin so when I removed the paper a decent amount of muffin stuck to it. Do you know how I could avoid this in the future? I didn’t try to remove the paper until they were completely cool and I still had this issue. Thanks for any tips! Tip! If you let them cool completely and then cover them for an hour or two, the paper should peel right off! Hi! When you say to cover them do you mean with a dish towel or something! These muffins were amazing but I had the same issue! Hi Lindsay! I just mean the first few hours out of the oven they can stick. So I usually hold off if possible, let them cool completely and then cover them in a plastic bag or a covered tupperware. Let them sit a few hours and they should come off easier. Overnight rest and they’ll peel right off! Just made this. Sooooooooooo goooood! Kids love it, too! I had a can of pumpkin puree leftover from the fall I’d been looking to use up when I just happened to find your blog via NutritionStripped. Holy. Moly. These are fantastic!! Like, ” I made a double batch fantastic”!! I used soy milk and “chia egg” instead of flax egg and they turned soooo most and delicious! This recipe is outstanding. I also love all the comments. I will definitely be incorporating the cloves, nutmeg next time. I don’t have regular flour at my house so I used: 1/2 cup of wheat germ, 1/2 oatmeal and 1/2 kosher corn flour. i think next time i will use almond meal. these things are delicious! i also added apples and almonds. Thank You! So glad you liked these! Thanks for noting your changes. This is so helpful for people making variations. These look AMAZING! I’m going to make them tomorrow for a baby shower. Do you think there’s any way I could make them gluten free? Sub the flour for a gluten free mix?? I’m also planning on using Trader Joe’s pumpkin butter instead of the puree. I’ll let you know how it goes! I’m about to make these, GF style. This is the third time I’ve made them, I think. I just sub in GF flour (Pamela’s Artisan Flour Mix, in a blue bag; NOT the pancake mix because that has leavening in it already). They are different than the originals, I am sure, but still delicious. I also add cloves, nutmeg and ginger for more flavor. Yum. Best muffin recipe ever. Sooo good. I added walnuts too. hey i want to make these tomorrow and i was wondering if i could substitute earth balance butter for the canola oil and i dont have flax seed egg.. is there a substitute i could use? You can sub a regular egg or a chia egg (1 Tbsp chia seeds + 2.5 Tbsp water) and yes, earth balance will work great. Hope that helps! These muffins are so delicious! I have made them twice in a week. I used all whole wheat flour and 1/4 brown sugar 1/4 maple syrup like someone suggested. I’m really excited to try these, but I don’t have the flax seed, only regular eggs. Is it a 1:1 substitution? Am I safe using only 1 egg or is 2 a better option? Made these this morning, turned out great. I had to make adjustments to what I had and just plain preferred. So, I didn’t have a full 1/2 cup of pumpkin so I had to fill the rest with home made pear butter. Used almond milk and refined coconut oil. I try to limit out intake of white flour so I used a round cup of white wheat and a round cup of oat flour. Batter was thin compared to most of my muffin recipes but I cooked them anyway. I used mini muffin pans and cooked for 18 min. They turned out soft but not overly moist raw feeling. Not crumbly or tough. I think the perfect consistency. 4 yr old approved! Thank you for yet again a winner recipe! Keep the vegan ones coming!! I’d love to see some simple vegan dinner recipes!!! Oh….I also used 1/4 brown sugar and 1/4 cup maple syrup! I bought a giant can of pumpkin puree for some Halloween thing I never made and this make me feel way less guilty about it! Going to make them right now! How do u make the pumpkin purée?? Do you think it will make a difference if I use soy milk instead of almond? My daughter is allergic to nuts and dairy. They look so yummy! thanks. I believe soy would work fine, Deborah! I just made them with soy milk and they seemed to have turned out just fine! I haven’t tried one yet, though, since I’m still waiting for them to cool. oh my goodness! these look absolutely delicious, definitely have to make these soon, so convinced that pumpkin season= yummyness season. I just made these and they didn’t turn out great :( They were a little tough, so I may have overmixed the batter. I hope this isn’t a stupid questions, but I found your shop a week ago and I am dying to try EVERY RECIPE! Here it is: What is the flax egg? Is it a substitute for an actual egg? Or does the concoction end up looking egg like? I just want to be sure I know what to look for once I start making all your beautiful recipes. I see you mix the flaxseed meal with water, would it look somewhat like chia water by any chance? Would love to make this into a bread instead. Might you know the baking time if I decided to make it into a bread? Hmm, I think at the same temperature maybe 10-15 minutes longer? Just check at the 30 minute mark to test doneness. Then check every 5-10 minutes there after until golden brown and it looks pretty firm in the middle. Hope that helps! errrmm who the heck would a) NOT put the chocolate chips in (that should be a sin) or b) not want moistness!? 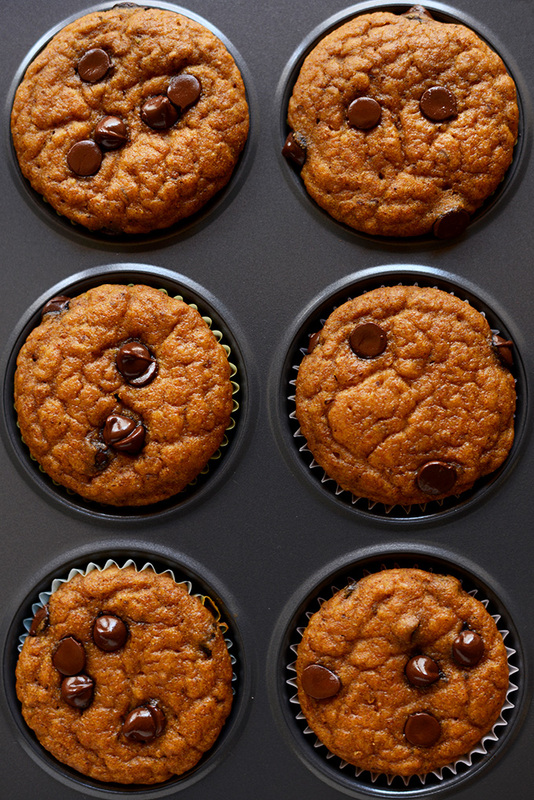 You cannot go wrong with pumpkin and chocolate, and the recipe keeping the muffins moist is a plus. How would I make this recipe non-vegan? It looks great, can’t wait to try it out. Can’t stop drooling over these beuties. I am totally going to make them as soon as I get my hands on a pumpkin! A little question, though: Can I add frosting on top and make it into a cupcake? I love a moist muffin (and I’m not afraid to use the m-word)! Have you tried these by mixing the flax in with the dry ingredients instead of making a true “flax egg”? I usually have more success with vegan baking that way? These look yummy…I am going to make them tomorrow. Pumpkin and chocolate, fabulous! Gorgeous pictures Dana! I need these in my life! These muffins look so delicious! I think I might have to make them for my chocolate-loving sister. haha! they look awesome. ohhh my gosh these look delicious! i’ve really gotta get my hands on some pumpkin puree – all these pumpkin recipes everywhere are making me crave it badly! I want these in my body….liiiiiike now. Pumpkin and chocolate is always a delicious combination for this season! Could I sub in whole wheat pastry flour for the unbleached all purpose flour? These look AMAZING!!! I made them yesterday (subbed all purpose for WW pastry flour and added a bit of cloves, nutmeg and ginger for a fuller flavor) and they were just scrumptious moist choco pumpkin bites of delicious goodness :) Thanks for the bringing the happy Fall party to my taste buds, Dana! OHMYGOOOOOOD these look so good!! I hate to say it but who the hell hates a moist muffin? Probably the person that hates chocolate. GET OUT. 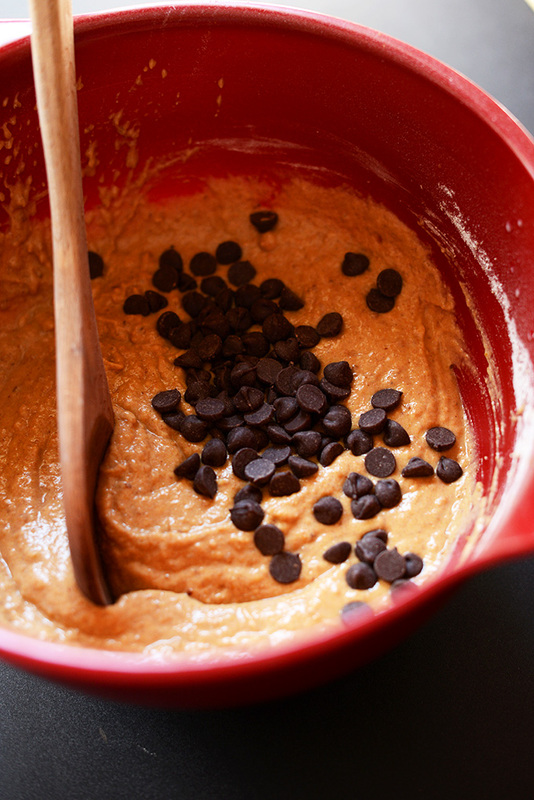 I’m totally okay with you dumping a bunch of chocolate chips in the batter! Mmm, sounds delicious. Oh my word. These look FANTASTIC. Definitely doing this soon!! I don’t know how a moist muffin could be a bad thing! Delicious! So much yum going on. 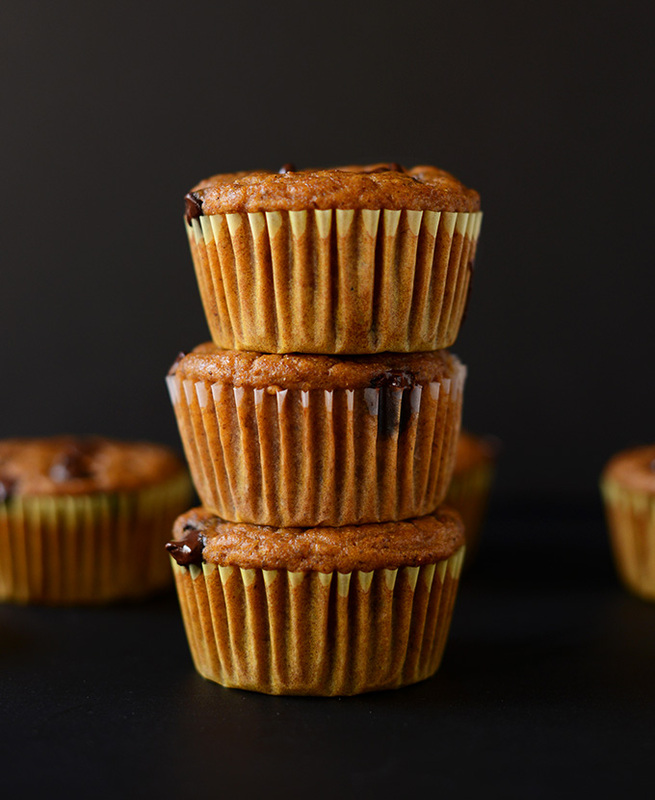 When it comes to muffins, the more moist the better! Pinned! love the vegan recipes–keep ’em comin’! Challenge ACCEPTED :D Thanks, Janae! Your pictures are absolutely stunning! I bought your eBook tutorial from Blogger U and I’m so excited to use it to create my first eBook! Yay! Please let us know what you create! We’d love to see it, Ali. Yeah, seriously! Can’t wait to see what you create! 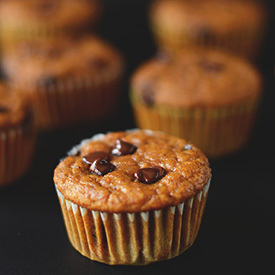 I think I’m pretty much incapable of making a muffin that doesn’t involve chocolate chips – these are so getting made. I love anything chocolate chip and pumpkin! I can’t wait to try these muffins!